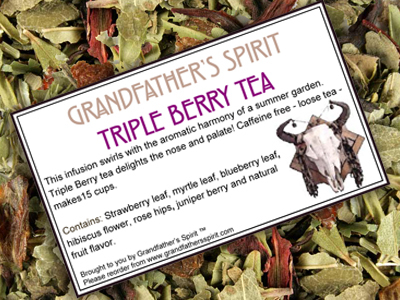 TRIPLE BERRY TEA: Brimming with goodness, Triple Berry tea is a leafy herbal speckled with crimson rosehips and dotted with flower petals! A blend of strawberry leaves, blueberry leaves, and myrtle leaves, this infusion swirls with the aromatic harmony of a summer garden, complete with the floral undertones of hibiscus. Finishing with the refreshing breath of juniper berries, Triple Berry tea delights the nose and palate! Contains loose tea - equivalent of 15 tea bags. Ships with brewing instructions. Ingredients: Strawberry leaf, myrtle leaf, blueberry leaf, hibiscus flower, rose hips, juniper berry and natural fruit flavor. Caffeine free!